The 2014 high school football season was filled with highlights, but no two teams may have made bigger splashes than the Hoover Bucs and the Oak Mountain Eagles. Hoover overcame two early losses to out-of-state powers to win its third consecutive state championship and the first-ever title in the newly-created Class 7A and continued a long winning streak against in-state competition. Oak Mountain surprised almost everyone except itself by posting an impressive 10-2 record that included a solid post-season run. The Bucs’ and Eagles’ strong seasons are apparent in the composition of the 2014 All-Over the Mountain team, which was selected by an exclusive poll of the area head coaches. Hoover placed 10 players on the team, while Oak Mountain followed with seven. Additionally, Oak Mountain quarterback Warren Shader and Hoover running back Bradrick Shaw shared 2014 Over the Mountain Player of the Year honors. Eagle coach Cris Bell, who brought the Oak Mountain program into elite status in only his third year at the helm, was named 2014 Coach of the Year. Shader, a junior, was a classic double threat at signal-caller for Oak Mountain, both rushing and passing for more than 1,000 yards. Shaw was a bruising force in the Bucs’ powerful offense. Briarwood quarterback Walker Lott was also chosen for the team. The running backs included Harold Shader of Oak Mountain, Marcus Webb of Hoover, Derrick Underwood of Homewood and Wade Streeter of Spain Park. As always, the All-Over the Mountain offensive line is big, agile and talented. This season’s selections are Zyggy Arledge and Nick Eldridge of Hoover, Justice Hammond and Blake Snow of Oak Mountain, Austin Chandler and Ben Cage of Vestavia Hills, and John Yarbrough of Homewood. The wide receiver corps includes Alex Elam of Hoover, Drew Odum of Mountain Brook and Lawton Dorough of Homewood. Hunter Schmith of Hoover is the team’s placekicker. The 2014 All-Over the Mountain defensive unit has strength and depth at all positions. Manning the defensive line are Christian Bell and Jaysen Cook-Calhoun of Hoover, Daniel McCool of Mountain Brook, Alex Robin of Vestavia Hills, Carter Bankston of Briarwood, and Griffin Gentry of Homewood. 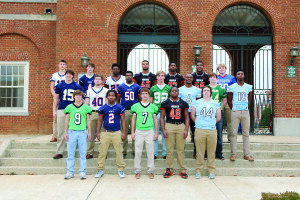 Members of the 2014 All-Over The Mountain Offensive football team include first row, from left: Drew Odum, Mountain Brook; Derrick Underwood, Homewood; Wade Streeter, Spain Park; Marcus Webb, Hoover. Second row, from left; Harold Shader, Oak Mountain; Austin Chandler, Vestavia Hills; Lawton Dorough, Homewood; Warren Shader, Oak Mountain; Alex Elam, Hoover. 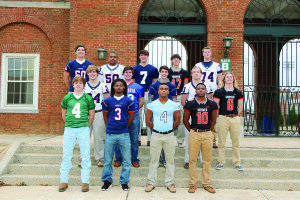 Third row from left: John Yarbrough, Homewood; Justice Hammond, Oak Mountain; Walker Lott, Briarwood; Hunter Schmith, Hoover and Blake Snow, Oak Mountain. Not pictured: Zyggy Arledge, Hoover; Bradrick Shaw, Hoover and Ben Cage, Vestavia Hills. As usual, there are plenty of standouts at the linebacker spots. Earning places on this year’s team are Christon Taylor and Riley Fowler of Oak Mountain, Darrell Williams and R.J. Arnold of Hoover, Perry Young of Spain Park, and Billy Parker of Shades Mountain Christian. The defensive backs are Payton Youngblood of Oak Mountain, A.J. Smiley of Spain Park, Griffin Rivers and Maurice Mayo of Homewood, and Matt Byers of John Carroll Catholic. Jody Purnell of John Carroll is the punter.